Norwegian Cruise Line, the innovator in cruise travel, offers guests a chance to escape the winter blues with three-to seven-day vacations to the Bahamas, Bermuda, Caribbean and Cuba as well as an exclusive Runaway To Paradise experience with Grammy Award-winner Jon Bon Jovi. With stress-free planning, flexibility to design a vacation that meets just about any budget and expectation and the opportunity to experience multiple destinations, cruising is the ideal option for this spring break. For the ultimate spring break vacation, Norwegian Cruise Line will host Rock and Roll Hall of Fame Inductee and Grammy Award-winner Jon Bon Jovi’s Runaway To Paradise cruise, in partnership with Sixthman and Runaway Tours, creators and leaders of world-class intimate artists experiences. Sailing from Miami on Norwegian Jade on April 12, 2019, guests will enjoy a three-day cruise to Nassau, Bahamas and an immersive experience which includes a full rock show starring the world-renowned music artist himself and the 11-piece Kings of Suburbia bands; a second acoustic storyteller set during which cruisers can ask Jon all of their burning questions; multiple shows from support artists; panels with key figures from Bon Jovi’s storied history; and much more. A second sailing is available on Norwegian Pearl from Barcelona to Palma, Majorca, Spain on August 26, 2019. Guests can choose from a quick three-day cruise, extended seven-day itineraries or all-inclusive options available on select sailings aboard Norwegian Sky and Sun, from convenient embarkation ports around the country. Guests can sail to Bermuda from Boston on Norwegian Gem and from New York on Norwegian Escape on seven-day cruises that include two overnights on the island. Norwegian Escape also offers seven-day cruises to Bahamas and Florida, with calls to Port Canaveral, Florida, and Nassau and Great Stirrup Cay. Norwegian Jade and Norwegian Pearl will also offer 10-day cruises with calls to Bermuda; Port Canaveral, Florida; and Nassau and Great Stirrup Cay. Norwegian Breakaway offers five-to-seven-day cruises to the Western Caribbean with calls to Cozumel and Costa Maya, Mexico as well as Belize City and the company’s private resort destination Harvest Caye, Belize. Norwegian Pearl is sailing four-day cruises to the Bahamas with a call to Great Stirrup Cay, Bahamas and seven-day voyages to the Western Caribbean with calls to Harvest Caye, Belize; Costa Maya, Mexico; Roatan, Honduras; and George Town, Grand Cayman. Norwegian Sun returns for a second season of cruises to Cuba with four-day all-inclusive itineraries to Havana, including an overnight, with select sailings also calling to Key West, Floria. From Port Canaveral, Florida, guests can sail to the Bahamas on Norwegian Epic with four-day cruises, and three-day voyages on Norwegian Sun with a free open bar. Ports of call include Great Stirrup Cay, Nassau and Grand Bahama Island. Norwegian Epic also sails seven-day Eastern Caribbean cruises with calls to Great Stirrup Cay, Bahamas; St. Thomas, U.S. Virgin Islands; and Tortola, British Virgin Islands. Five-and-seven-day cruises to the Western Caribbean are also available and include calls to Great Stirrup Cay, Bahamas; Ocho Rios, Jamaica; George Town, Grand Cayman; and Cozumel, Mexico. 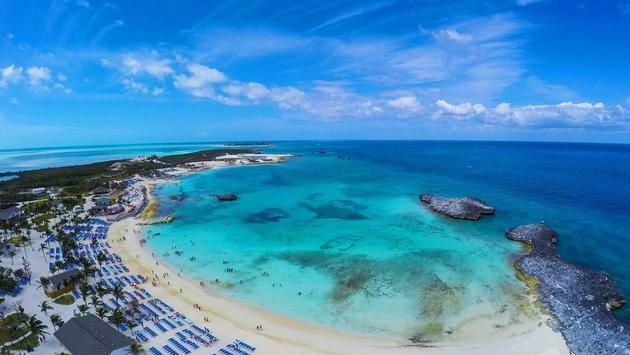 Those escaping from the cold can enjoy three-and-four-day cruises to the Bahamas on Norwegian Dawn, and on the recently refurbished Norwegian Sky with free open bar, with calls to Great Stirrup Cay, Nassau and Grand Bahama Island. Norwegian Sun and Sky offer four-and-five-day cruises to Cuba that include overnights in Havana and additional calls to Great Stirrup Cay and Nassau, Bahamas; and Key West, Florida. Select sailings on Norwegian Sky include a free open bar. Seven-day Eastern Caribbean itineraries are available on Norwegian Star and include calls to Nassau, Bahamas; St. Thomas, U.S. Virgin Islands; and Tortola, British Virgin Islands. Four to seven-day cruises to Western Caribbean are available on Norwegian Dawn, Sun, Getaway, Breakaway and Star, and include calls to Costa Maya and Cozumel, Mexico; Harvest Caye, Belize; Roatan, Honduras; Great Stirrup Cay, Bahamas; Ocho Rios, Jamaica; and George Town, Grand Cayman. Sailing year-round to the tropics and the company’s private resort destinations—Great Stirrup Cay in the Bahamas and Harvest Caye in Belize—Norwegian offers a variety of experiences across its 16-ship fleet for travelers looking for a memorable vacation. Onboard, guests enjoy the freedom and flexibility to design their dream vacation with the no set dining times, world-class entertainment, comfortable accommodations, stand-out attractions and no formal dress codes. For more information or to book a cruise, please contact a travel professional, call 888-NCL-CRUISE (625-2784) or visit www.ncl.com. SOURCE: Norwegian Cruise Line press release.